Challenge your artistic boundaries. Think inside the box, literally! You only have 144 square inches to express yourself. This is an open invitation for winter-themed artwork, in any media of two or three dimensions. In keeping with the Small Treasures theme, artwork will be restricted to a maximum size of 144 square inches, but not limited to any specific dimensions. Works that will be considered include art in any media including but not restricted to oil, acrylic, watercolour, sculpture, glass and clay. Mass produced reproductions will not be considered. Preference will be given to works which reflect the show's theme as well as the natural beauty Canadian Rocky Mountains. All artwork submitted must be available for purchase or it will not be accepted into the art show and sale. Click here for more information and to download the submission form. Harmony Arts, West Vancouver’s mid-summer arts festival, showcases a Slow Clothes Day, Tuesday August 6. A Slow Clothes Fashion show, featuring the work of artists working in various fibre media to produce one-of-a-kind garments, will be presented on the main stage at the foot of 15th St., West Vancouver, at noon. The show will offer the work of over a dozen artists, and is being co-ordinated by VGFA members, Monica Brammer, Deb Ryan, and Ros Aylmer. There will be an opportunity to have a close up look and purchase from the artists, after the fashion parade. At 3pm that afternoon, Charllotte Kwon,of Maiwa Handprints will present Waiting For the Monsoon, Slow Clothes in India. Join Charllotte as she explains her involvement with the peoples of India to bring the work of their artisans to markets right here in Vancouver. Slow Clothes are made, one at a time, by artisans steeped in the history and traditions of the process, and whose work results in articles of singular beauty. Two events not to be missed by lovers of fine textile work. For more info on Harmony Arts, click here. 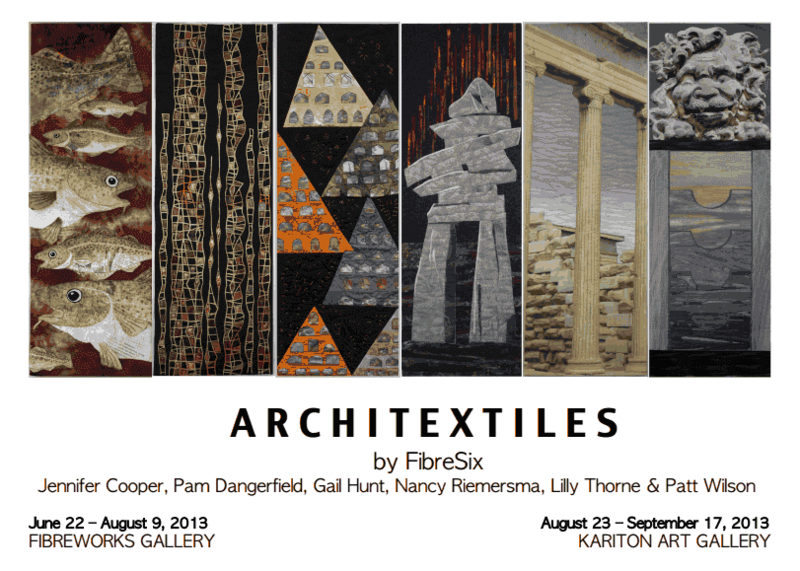 Architextiles at FibreWorks: exhibition at FibreWorks Gallery in Pender Harbour, which includes work by SDA members Patt Wilson, Jennifer Cooper, Gail Hunt and Lily Thorne, as well as Pam Dangerfield and Nancy Riemersma. 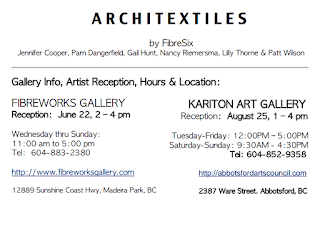 The opening reception is June 22 in Pender Harbour, from 2-4pm. 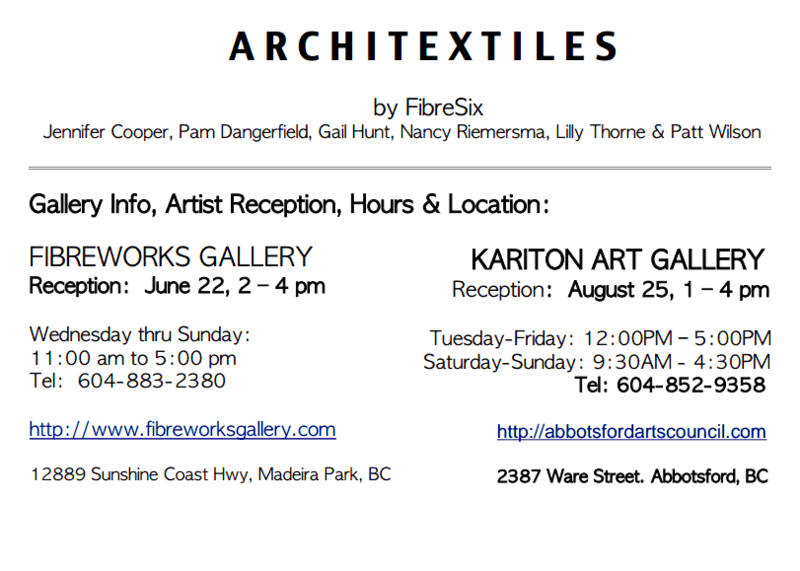 Please note that this exhibition will also show in Abbotsford - see invite for details. Red Deer College Series Summer Arts School. As food for thought and a "jog" for action, i'm including a link to a friend in Ontario. Some of it is a bit personal to the writer, but she raises some good points about being a "member" of *any* group. All good points in that link. I hope we get even more going this coming year in Alberta... Beware, I might call on YOU for help. I have found folks here in Alberta only too willing to help me organise - Thanks again... and the more help the better I say, so come forward and let's do more of what You want.